Lately I have been really into make-up for my eyebrows. Up until last year I used to never do anything for my brows, and then someone did my make-up and used a pencil on my brows, and it did wonders. So ever since then I been trying out different ways to fill in my eyebrows, because let's be honest it really makes a good difference in the way you look. Sometimes they just need a little help to be filled in! 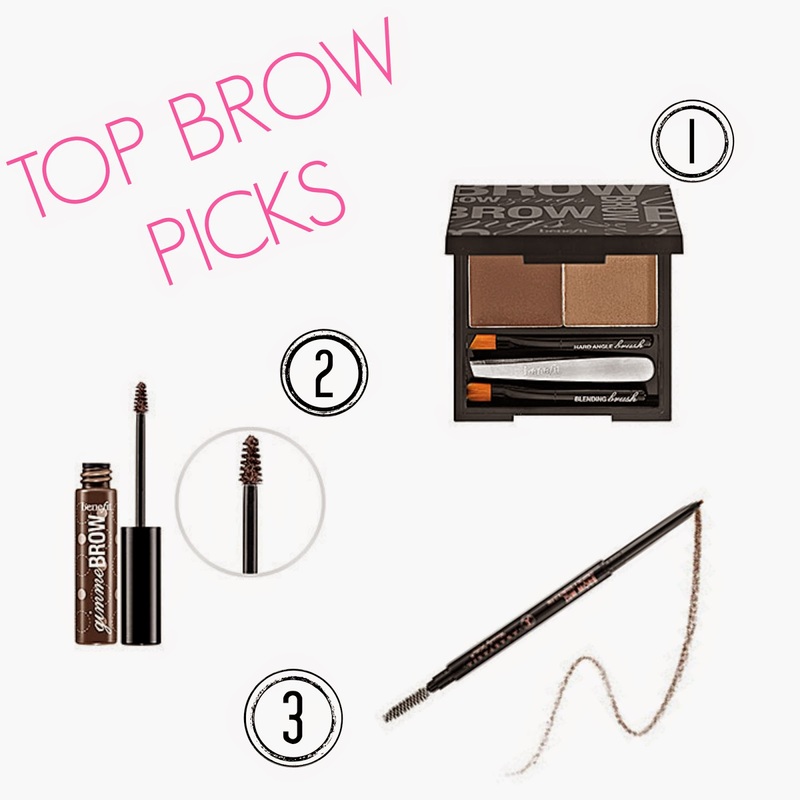 Here are my top three picks for your brow! They are three different kinds of ways to fill them in and I have grown to love them! The first pick is the Benefit Brow Zings, if you don't like gel or a pencil then this is your go to! Its everything you need in one to make your eyebrows look great! It comes with a wax to define and shape your brow and then a setting powder! I love using this product, although its not my favorite out of the three its a great product! And one thing I love about it is how easy it is to use. My next pick and my second favorite is the Benefit Gimme Brow! I seriously love this stuff, its no joke so easy to use. Its really fast way of getting filled beautiful brows! Its basically a brow volumizing fiber gel. It gives your brows a think and lush look. It fills your brow in perfectly, so it gives the appearance of full looking brows. It really lasts all day, which I love, because I don't have to worry about them at all. Gimme Brow is the perfect tool if your brows have sparse areas. I definitely recommend this to anyone who is looking for a great brow tool! My last and favorite pick for your brows is the Anastasia Brow Wiz. I used to be all Gimme Brow and nothing else, and I still love Gimme Brow but once I started using this brow wiz I'm hooked! Everyone has raved about this product and all for good reason. I was adamant about using it because I'm not a huge fan of pencils, but now I seriously love this. My favorite thing about this is how NATURAL my brows look with this. I will say that all these picks your brows will look natural but this product makes them look the most natural! This pencil has an ultra fine tip making it easy to fill in sparse areas, and it does a great job mimicking your brow hair. Because the tip is so fine you have total control when filling in your brows, which is great because its easy to go overboard on your brows. I also feel like it goes on so smoothly, which is a plus! Ya, I'm addicted to the Anastasia Brow Wiz too!! :) It's amazing!! i use gimme brow currently, but i'll have to try the anastasia brow wiz next!